It all started with Teyrn Loghain Mac Tir, a brilliant military strategist, the hero of the Battle of Riverdane, trusted advisor to King Cailan, father of the queen, and loyal friend and guardian to Cailan’s father Maric. When King Maric’s ship was lost at sea, Loghain spent two years searching for him, nearly bankrupting the Ferelden coffers. Why then would this man orchestrate the death of Maric’s heir—a boy whom Loghain had helped to raise in honour and memory of his lost friend—and throw Ferelden into civil war with a Blight looming on the horizon? 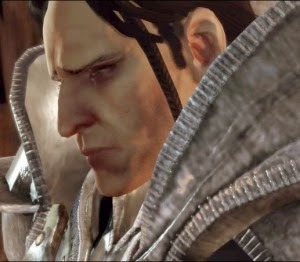 As I played through BioWare’s Dragon Age: Origins, Loghain’s scenes showed me a man filled with regret. I got to speak with characters who had known and trusted him. Some of them thought him suddenly mad with ambition or fear that the nation of Orlais would once again attempt to take over Ferelden. But his history with Ferelden and with his best friend Maric implied that there was more to him. That this regicide had been a difficult decision, and it had cost him deeply. The question then of why Loghain would go to such lengths plagued me. This was how I took my first step into the world of gaming tie-ins.